Androgenetic alopecia (AGA) is the most common type of hair loss characterized by progressive thinning of the scalp hair and a reduction in hair density and diameter. AGA in men presents with a typical pattern of bitemporal and frontal recession of the hairline or vertex thinning, which gradually extends anteriorly. Hair restoration surgery for AGA essentially involves various forms of hair transplantation. The hair transplantation is based on the principle of donor dominance, that is, hair follicles that are androgen insensitive keep their properties even after transplanting into scalp areas affected by AGA. Follicular unit extraction (FUE) technique for hair restoration has gained popularity in recent times. There is paucity of studies assessing donor area in Indian men and also no simplified guidelines are available for the safe donor area for FUE. Our study is an attempt to study the donor area in Indian men and to devise simplified guidelines for the safe donor area. A straight line was drawn joining two points, which are 27–28mm from the line drawn perpendicular to tragus, passing through external occipital protuberance. A square of area 1cm2 was drawn in the midline, 2cm above the external occipital protuberance. Two squares of the same area were drawn one on each side, 5cm lateral to the first square [Figure 1]. Hairs in all the three squares were trimmed and photographs were taken. Number of FUs and number of follicles were counted in each of the square. Average of the FUs and follicles in the three squares was calculated to obtain mean density in the donor area of the scalp. Number of FUs present in the extractable area of the scalp = Total extractable area in the scalp × density of the scalp. Line A: A straight line was drawn joining two points, which are 27–28mm from the line drawn perpendicular to tragus, passing through external occipital protuberance. Line B: A line drawn parallel to line A, 1cm above line A. We considered beard hair present inferior to the jawline for the extraction. Jawline is the superior border for extractable area in the beard, whereas straight line passing through Adam’s apple was considered inferior border of extractable area in beard. A straight line was drawn joining angles of mandible. A square of area 1cm2 was drawn in the midline, such that the line was passing through the center. Two squares of same area were drawn one on each side, 3.5cm lateral to the first square [Figure 4]. All the three squares were trimmed and photographs were taken. Number of FUs and number of follicles were counted in each of the square. Average of the FUs and follicles in the three squares was calculated to obtain mean density in the donor area of the beard. Total extractable area in the beard × average density of FUs in the beard = Total number of FUs present in the extractable area. Although 25% of them can be extracted without affecting the visual appearance, depending on patient’s preference, percentage of FUs extracted from the beard can be more and can be up to 100%. Total number of FUs available for extraction = 0.25 × Total extractable area in the beard × average density of FUs in the beard. H: length of straight line drawn parallel to line F up to where the beard hairs exist (if no clear demarcation between beard hairs and neck hairs, line H will be passing through superior border of Adam’s apple). A total of 580 men with AGA who consulted us for hair restoration surgery were recruited in the study. Their age ranged between 24 and 45 years with mean age of 31.7 years. Mean FU density in the scalp and beard was 78.2/cm2 and 49.7/cm2, respectively. Mean number of follicles in each FU in scalp and beard was 1.81 and 1.32, respectively. Mean hair density in scalp and beard was 141.5/cm2 and 65.6/cm2, respectively. Total available number of FU in the donor zones, (area 1, 2, and 3 and beard) extractable number of FUs considering 25% extraction are given in [Table 1]. Orentreich was the first American physician to perform hair transplantation for male-patterned baldness. He suggested theory of “donor dominance,” which stated that the transplanted hair keeps the original nature of the donor site even after being transplanted. Donor dominance theory of Orentreich and the definition of a safe donor area are the theoretical foundation, which made modern hair transplantation possible. Exact definition of safe donor area, which is the area that will have no hair loss, could not be defined by anyone. Because no safe donor area guarantees that the hair will be permanent. There only exists a safe donor area anticipated to have no invasion of alopecia. Thus, safe donor area can be defined as an area in which no progression of permanent hair loss occurs. The donor area described by Rassman and Carson has three significant boundaries. The anterior boundary is vertically superior to that of the external acoustic meatus. The superior boundary is located 2cm above the upper border of the helical rim of the horizontal plane, whereas the inferior border of the donor area is slightly controversial as it may move upward with the passage of time. 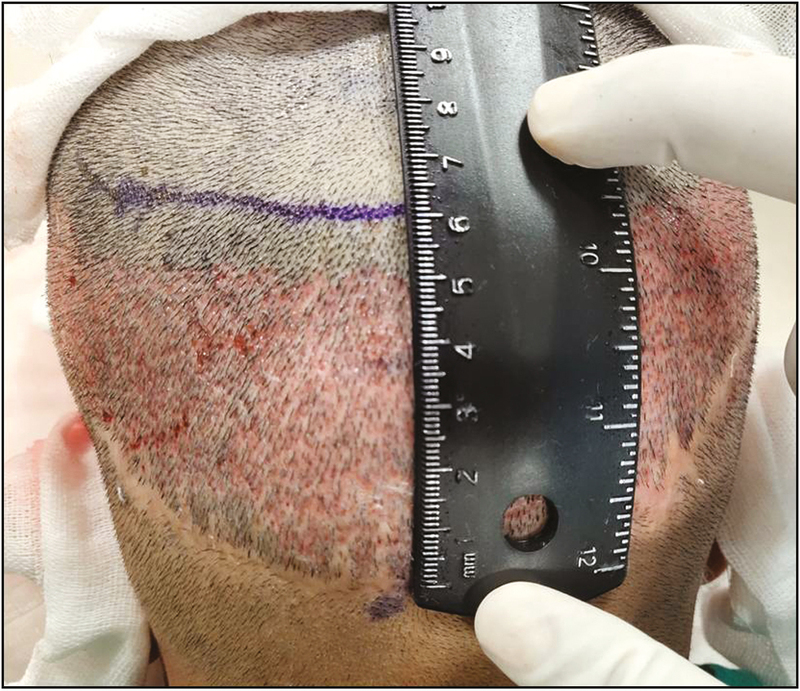 The most crucial and clinically critical standard for determining a safe donor area is the superior border, which is profoundly related to the maximum extent of vertex alopecia. The definition of the safe donor area, which is currently being applied globally to surgical practice by most physicians, is an adaptation of theory presented by Unger. He defined alopecia as a continuous progressive condition, by calculating the probability of the worst-case scenario, he proposed the most reasonable standard. His definition was in accordance with the facts that the global mean life expectancy was ≤80 years and >80% of men aged between 70 and 79 years manifested baldness that is less than Norwood type VII. Cole and Devroye defined the total permanent donor area as 203cm2 and he further divided it into eight major regions (3.5×6cm) and six minor regions (3.5×2cm). There is no universally acceptable definition for the safe donor zone. This study is an attempt to give a simplified guideline based on the existing knowledge on the safe donor zone and our practical experience. 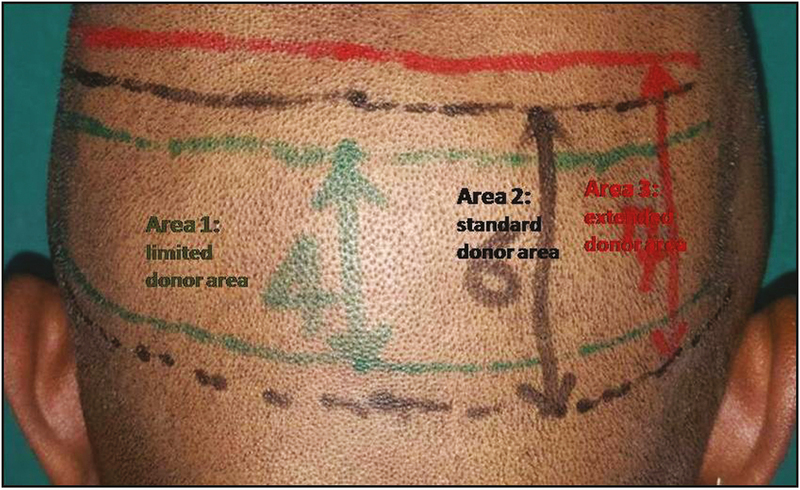 We propose three types of donor areas, namely, limited donor area (area 1), standard donor area (area 2), and extended donor area (area 3) (limited donor area is more permanent than standard area, which is more permanent than extended donor area) [Figure 5]. Mean available number of FUs for extraction from these areas, considering 25% extraction, is given in [Table 1]. Though 50% hairs can be extracted without apparent decrease in the density, it should not be done in a single sitting as it can lead to extensive microvascular damage, which in turn causes decrease in the quality and thickness of remaining hairs. We recommend 25% extraction in the first sitting and extraction of 25% of the remaining hairs in the second sitting, which should be at least 6 months apart (making a total of 25% + 18.75% [0.25×75] = 43.75%). In beard, the concept of safe donor zone is not delineated. We suggest safe donor zone in the beard, which should be cosmetically acceptable to most patients, that is, below the jawline. In beard, higher proportion of hairs can be extracted depending on the requirement. As we have taken beard hair only below the jawline, cosmesis of the patient is not much affected even after total extraction. If required, hairs can also be taken from above the jawline if patient is comfortable with it. But it is not something we recommend. Extraction from extended donor area should be carried out only after explaining the patient about the relatively nonpermanent nature of the hairs and that they have to be implanted in a cosmetically less significant zone. In our study, we have seen for the miniaturization of the follicles both downward from vertex and upward from below. We have seen miniaturization in 12% (70) patients, extending either into the extended donor zone or 1cm above it [Figure 6]. Miniaturization was observed in 3% patients, extending into the standard donor zone. If there is miniaturization, area at least 1cm below it has to be avoided. Though we have seen many cases with reverse pattern hair loss, we have not found it extending to external occipital protuberance in any. 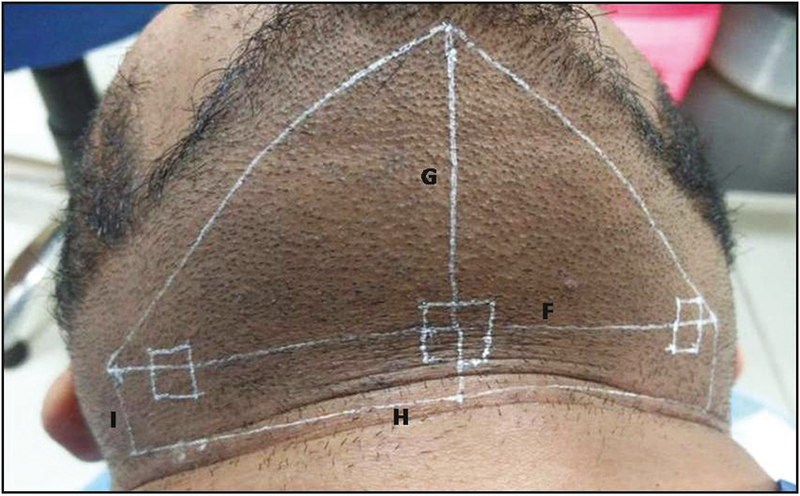 We used digital photography as a tool for quantification of hairs and FUs in the donor scalp and beard. In our study, we measured hair density at three different regions of the donor scalp and took average of the three. Mean FU density in our study in the donor area of scalp was 78.2/cm2, whereas average hair density was 141.5/cm2. Jimenez and Ruifernández devised a mathematical model for estimating donor size for FU transplantation. They also used digital photography for quantification of hairs, FUs, and interfollicular distance. 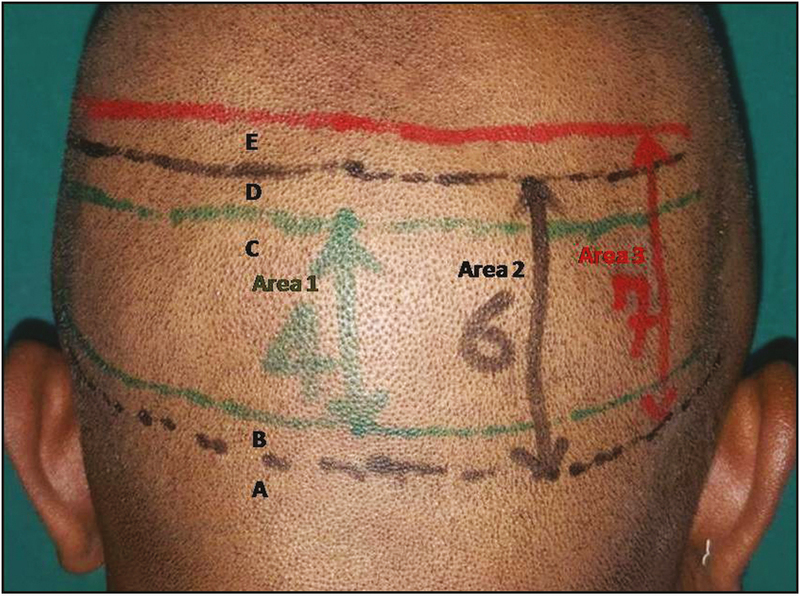 They studied hair density by marking a single rectangle of area 0.5cm2 (1×0.5cm) in the occipital scalp and extrapolated the results, considering hair density is maintained constant throughout the donor scalp, and found the mean density of the occipital donor area was 65–85 FUs/cm2. A review of the literature reveals a significant variation among different authors regarding the counts of hair density, which is probably due to either racial variations or the methodology used to count the hairs per unit area. Limmer finds a range of 120–240 hairs/cm2 and Haber and Stough 144–176 hairs/cm2. Bernstein and Rassman found significant racial variations in the hair density and FU density among Caucasians, Asians, and Africans. The African individual has a lower hair density (average 160 hairs/cm2) than the Asian (average 170 hairs/cm2) and Caucasian (average 200 hairs/cm2). Average hair density in donor area measured by different authors include 150–300/cm2 by Bernstein, 124–200/cm2 by Jimenez and Ruifernández, 190–210/cm2 by Cole and Devroye. 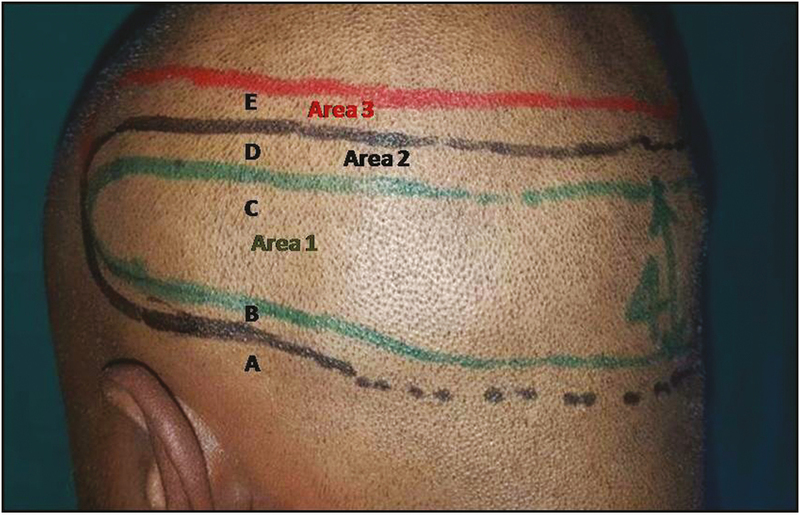 Designing and planning of the recipient area and assessment and management of the donor area are the most important factors in hair transplantation. An estimation of the number of FUs that can be harvested is important for planning a hair transplant session. The placement strategy can be refined by knowing information about the number and type of grafts. Experienced surgeons can predict the harvest requirements at a glance, but for novice surgeons, it is useful to follow some guidelines because an accurate estimation of the donor area is important if surgical results are to be predictable. There may be little thinning of safe donor zone in the parietal area. It was ignored for the sake of easy calculation. Hamilton JB. 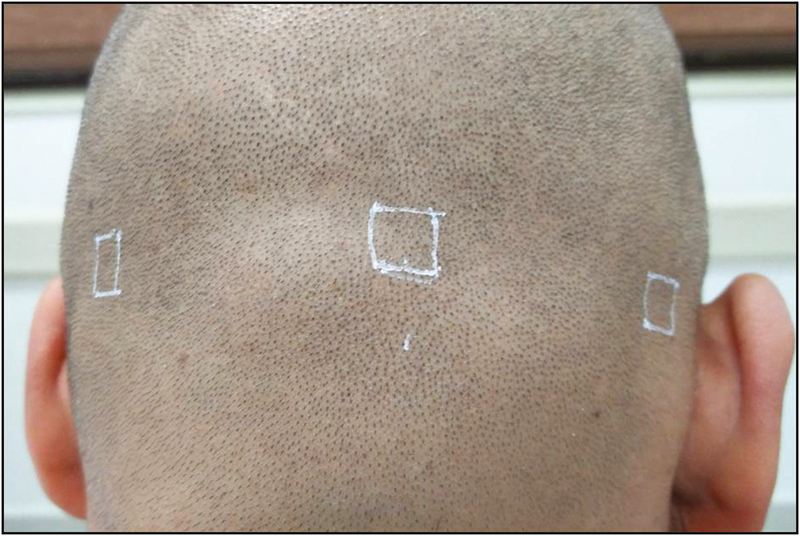 Patterned loss of hair in man; types and incidence. Ann ny Acad Sci 1951;53:708-28. Orentreich N. Autografts in alopecias and other selected dermatological conditions. Ann ny Acad Sci 1959;83:463-79. Knudsen RG. The donor area. Facial Plast Surg Clin North Am 2004;12:233-40. Rassman WR, Carson S. Micrografting in extensive quantities. The ideal hair restoration procedure. Dermatol Surg 1995;21:306-11. Unger W. Delineating the safe donor area for hair transplanting. J Am Acad Cosmet Surg 1994;4:239-43. Cole J, Devroye J. A calculated look at the donor area. Hair Transplant Forum Intl 2001;11:150-4. Jimenez F, Ruifernández JM. Distribution of human hair in follicular units a mathematical model for estimating the donor size in follicular unit transplantation. Dermatol Surg 1999;25:294-8. Limmer BL. The density issue in hair transplantation. Dermatol Surg 1997;23:747-50. Haber RS, Stough DB. Accurate estimation of graft requirements when using multibladed knives. In: Stough DB, Haber RS, editors. Hair replacement: surgical and medical. St. Louis, MO: Mosby;1996. pp. 138-42. Bernstein R. Accurate follicular unit transplantation. In: Haber R, Stough D, editors. Hair replacement: surgical and medical. St. Louis, MO: Mosby, 1996. pp. 138-42.